Chip and Janice Wilmot stand in their edible landscape, with a serviceberry tree in the background. Chip holds produce he picked from the garden. When Chip and Janice Wilmot moved into their Lilburn home in 1993, they planted traditional laurel shrubs in their front yard. “It was a little boring for us,” Janice admits. The couple enjoys cooking and entertaining guests, so eight years ago, they decided to extend that ethos into their garden and grow their own edible landscape. By definition, these ornamental gardens incorporate some type of edible plant—whether that’s a leaf, fruit, seed, or even flower, says L. Daniel Ballard, the owner of Convivial Gardens, an Atlanta-based landscaping company that specializes in edible gardens. “We live in an urban environment, so people are more conscious of not only having a beautiful landscape, but having a landscape that they can interact with,” Ballard says. Edible landscaping has also sprouted in popularity due to the cost savings of growing food at home versus buying produce at the grocery store. Ballard says that while there is an upfront cost for the garden, which varies depending on size and type of plants involved, most people won’t need to replant their edibles every year. 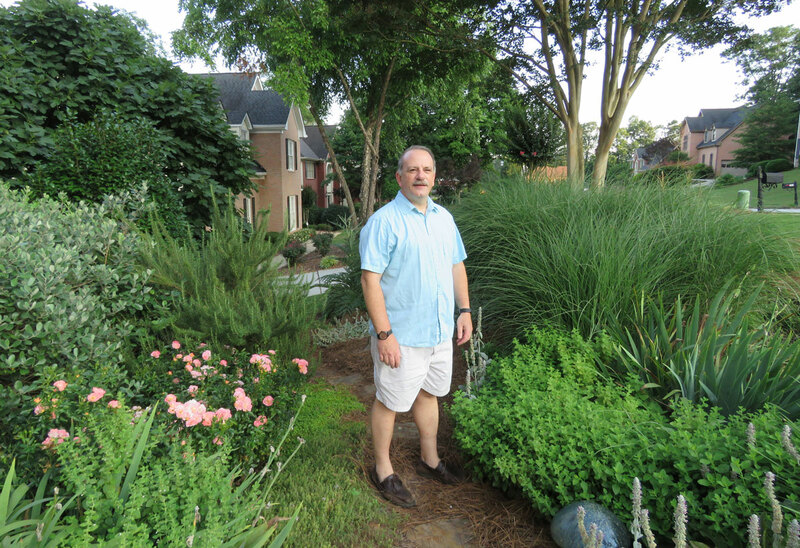 Chip Wilmot stands in his Lilburn home’s edible landscape. The Wilmots walk through their garden, which spans across all sides of their house, pointing out more than 30 different edible varieties: pineapple guava, figs, bee balm, lemon balm, lemon thyme, alpine strawberries, blueberries. The list goes on. 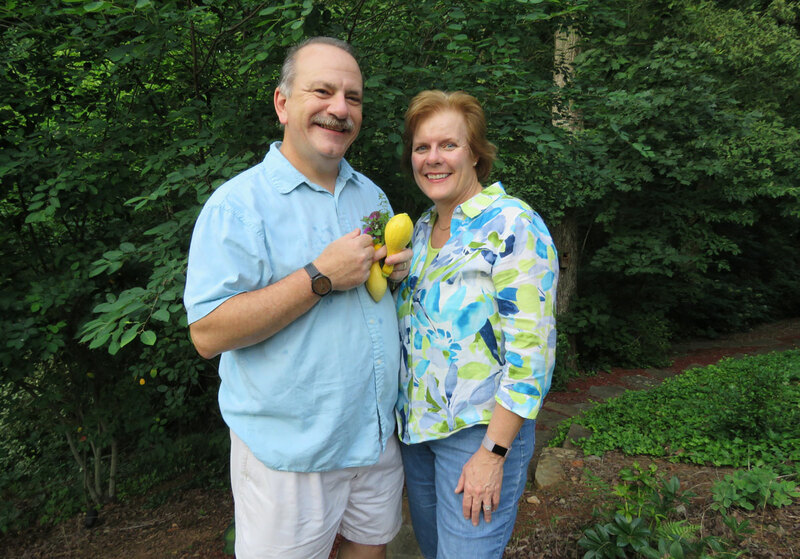 Chip and Janice Wilmot have a fig tree and use the leaves to wrap grilled fish. 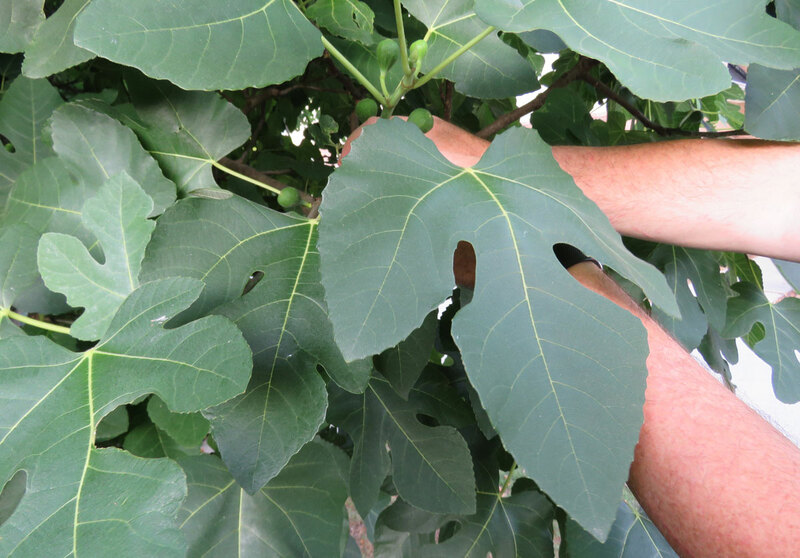 He uses the leaves from his garden’s fig tree to wrap grilled fish, and, he tells his wife, he just found a recipe for fig leaf ice cream he’s eager to try. In addition to being an economical food source, an edible landscape can also make a statement. Mitch Jaffe, the CEO of PREP, a shared kitchen in Atlanta that is the culinary base for 120 food companies such as Verdant Kitchen, Emerald City Bagels, and Salsa Sol Del Rio, installed an edible landscape when the facility opened in 2014. Peaches, blueberries, and figs grow along the edges of the buildings in lieu of typical flower beds. PREP’s edible landscape doesn’t produce food for any of the 120 companies—it is more to show that the shared kitchen supports the mission of its producers who often cook with local, seasonal ingredients. It’s also a source of snacks for hungry chefs at work in the kitchen and for people touring PREP’s facilities. The garden also attracts colorful songbirds. Ballard says choosing plants that animals and insects can enjoy is the cutting edge of edible landscaping. “People are able to look out their own windows and see more and more wildlife in their yards,” he says. In order to cultivate an edible landscape, Ballard recommends looking at where you need coverage and thinking about edible options that can be used in place of traditional plants. “What would it look like if, instead of planting a crepe myrtle, I planted a persimmon tree or apple tree?” Ballard says. Blueberries are the best edible landscaping plant because they are easy to grow, he says. Other plants that thrive in Atlanta are thornless blackberries, Asian and American persimmon trees, raspberries, and strawberries. Serviceberries, which taste like blueberries with an almond tint, are native to Georgia. If you’re looking for somewhere small to start, Ballard says herb gardens, including mint and basil, can be easily incorporated into existing landscapes. 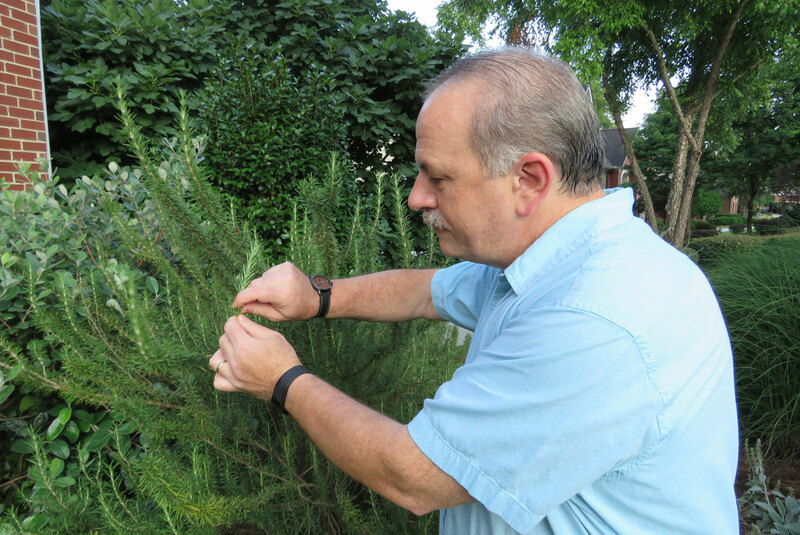 Chip Wilmot picks rosemary from the garden. Chip recommends bee balm, Mexican tarragon, parsley, and to cover the ground, thyme. He and Janice spend one to two hours per week tending the garden and don’t use pesticides. It’s also important to know what you want your garden to look like and what will work for your particular yard. For example, most tomato varieties won’t flourish without eight hours of full sunlight, Ballard says. Chip says some varieties of edible plants like to migrate, so if left alone, the garden can look more natural than manicured. Ballard says having tomatoes and salad greens in boxes can give defined place for those plants. Janice also warns that untrained lawn service companies can spray or cut edible plants because of lack of familiarity. Ballard recommends using landscape companies that specialize in edibles. Done right, edible landscaping can be rewarding—not only is it sustainable, but it gives creative cooks a chance to experiment with uncommon ingredients. 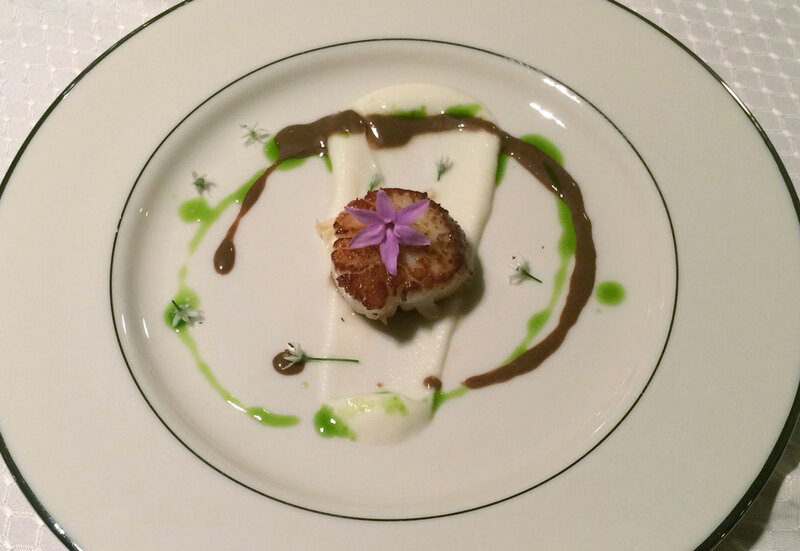 Using ingredients from their edible landscape, Chip and Janice Wilmot cooked seared scallop with celeriac purée, black garlic sauce, basil oil and leek florets, topped with an allium flower. Want to learn more about crafting your own edible landscape? Homestead Atlanta offers edible landscaping classes and workshops. An upcoming tour of an edible garden in Decatur will be held September 30 at 2 p.m.—visit Homestead Atlanta’s website for more details and to sign up.